Since the company’s inception in 1974 Batorer Precision Engineers has enjoyed 4 decades of continuous growth. Having established an excellent reputation for the manufacture of high-quality precision components, delivered on time and at the right price, Batorer has developed into one of West Yorkshire’s leading subcontract precision Engineers. Although Batorer’s original customers were involved in a relatively narrow range of industrial sectors, the company now boasts a broad client base that operates across a wide range of industries. To meet the varied needs and capacity requirements of its diverse customer base, Batorer has invested heavily in a wide range of advanced CNC machine tools. This has enabled the company to take on a wide range of jobs, from one-offs, through small batch work to long, production runs in a wide range of sizes and materials. A policy of continuous investment in ‘state of the art’ manufacturing and quality control equipment and the employment of highly skilled operators has enabled Batorer to maintain its impressive levels of productivity and to ensure strict adherence to the company’s demanding quality standards. Batorer Manufacturing Director Simon Irving explained: “As our guiding principle is to guarantee competitive pricing, prompt delivery and the supply of high quality components, not only do we invest heavily in the most efficient machine tools, we also ensure that we continually update our quality control equipment. “Given the broad nature of our customer base, the varied components we produce and our ever growing workload, we recently undertook a search for a flexible measuring system that could accommodate our diverse output. “As much of our work relates to high-volume, fine-tolerance parts, we needed to purchase a system that not only had the required precision, but was also able to undertake speedy measuring routines. “Having looked at several alternative vision system, most of which had one or two good points, as the Venture 3030 from Baty International included more functionality as standard than any other package on offer, we were happy to make the purchase. “Now in almost constant use, our Venture system is proving the ideal tool for our needs; following a short course from Baty our operators became very proficient in the systems use. 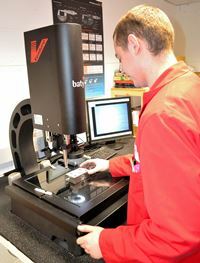 As the Venture’s controls are fairly intuitive, we are now able to achieve very rapid and accurate results. Baty International’s highly successful Venture range includes both manual and full CNC systems that cover two standard measuring ranges. The 2510 has a 250mm x 125mm x 165mm X,Y,Z measuring capacity, whilst the 3030, as purchased by Bartorer Precision Engineering has a 300mm x 300mm x 165mm X,Y,Z, capacity. The Venture range’s original design brief was to bring together high-end software functionality with a quality camera system, based on a proven mechanical design. In addition to providing high levels of precision, the system needed to be easy to operate and be offered at a competitive price. Impressive global sales of Baty’s best selling system would indicate the design brief was achieved. Designed to provide accurate results when used in a dedicated inspection department or on the shop floor, the latest version of the manually operated Venture 3D vision system has a colour touch screen, ensuring that there is no need for a mouse or keyboard to clutter the workstation. Full geometric functionality enables features such as circles, lines, arcs and points to be measured using dedicated tools. Data points are automatically taken along the edge of the measured feature using video edge detection, then all measurements are automatically saved within the on-screen features list. The Venture’s programmable LED lighting is also controlled using the touch screen. Surface, through the lens and profile lighting conditions can be adjusted to ensure that the feature edge is perfectly illuminated. Tolerances’ can be set for each dimension so that when the measuring routine is completed, the automatically generated final inspection report clearly displays pass or fail status for each feature. For parts that need to be measured regularly, measurement routines can be ‘recorded’, saved and recalled when next required. Throughout this procedure the operator is guided through the process by display. Prompts. Magnification, VED tool, positioning, the number of data points required and the exact lighting conditions are all reproduced by the system; this ensures that each part in a batch is measured the same way for optimum repeatability. Fusion software allows the use of both touch probe and camera measurements in the same inspection so that features that are out of the camera’s view can be measured without re-positioning the part. The manual Ventures has 6 preset zoom positions which provide a magnification range from approx. 30x – 200x extending the use of auxiliary lenses. Each preset position is pre-calibrated enabling the user to quickly select the optimum magnification for each measurement and continue measuring.